The combination of ocean, rock, plants, waterfall and sand make McWay Cove one of the most beautiful and peaceful spots on the planet, or at least it feels that way when you're there. Imagine an ideal landscape that creates a spot that's perfectly beautiful. What would that have? Turquoise water? Steep rocky cliffs? Clinging, stately trees? A jutting peninsula into the ocean? A pristine beach? A waterfall? McWay Cove at Julia Pfeiffer Burns State Park has all of that. The cove is the highlight of the park and is every bit as beautiful as you can imagine. Interestingly, the ideal cove was improved, in the opinion of some, by a disaster just up the coast. In the 1980's a enormous landslide closed Highway 1 for a year. The rock, dirt and silt shorn from the Santa Lucia Range was deposited into the ocean less than a mile north of the cove. The ocean currents got to work transporting that material and some of it ended up in the cove. Prior to that event the cove had no beach to speak of. It was beautiful, but rocky. Now the hard edges of the cove are covered in a silky smooth sand sheen. The descending from the trailhead towards Partington Point. McWay Cove is not the only picturesque cove in the park. Just north of the park's signature feature is a another trailhead right on Highway 1 leading down to Partington Point. 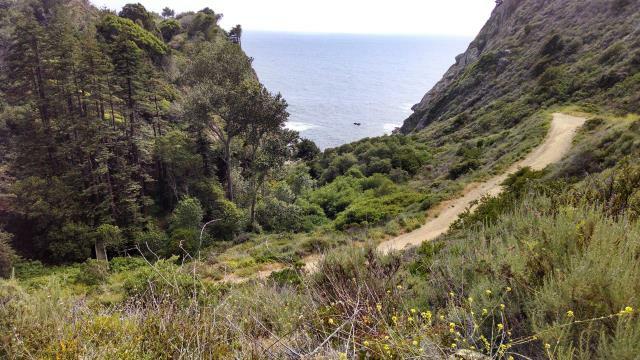 Here a small steep ridge separates two separate coves, each more private than the more popular McWay Cove. The path leading directly down to the first Partington Cove had some poison oak problems when we visited, so be careful when walking on paths with lots of overgrowth. Your efforts for making the journey are a narrow cove with a rock strewn beach over which crash wave after wave from the ocean. There's little or no sand here, just countless rounded rock from pebble up to boulder sizes. One of the secluded coves at Partington Point. Coppertone and I had the cove all to ourselves for some time. The second Partington Cove lies on the other side of the steep ridge. The only way to get there is through a short tunnel that had been bored through the rock years ago to make the delivery and transportation of goods via boat possible. 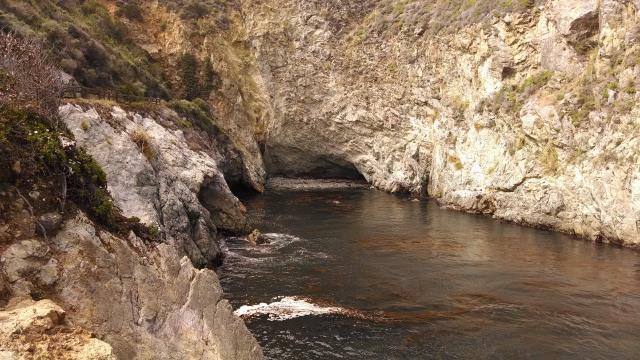 Now the tunnel empties hikers out into a secluded cove with vertical walls and a tiny beach of pebbles and sand. A rocky outcrop descending into the ocean features a couple of tidal pools in which crabs battle for prime hiding spots. With all of the attention focused on the coves it may be easy to forget that the park has miles of trails inland as well. On the opposite side of Highway 1 there is ample parking and trailheads for paths leading up into the Santa Lucia Range overlooking the shore. Beyond the park's borders lies the larger Los Padres National Forest. All told, the park consists of four square miles of land. What remains to be seen on future trips to the park is how well things are maintained on the lesser used inland trails. Given California State Parks' fiscal problems they've had to cut some corners and clearing trails is one the items that's more easily cut from the budget. Given that the park is far from population centers means that there are fewer volunteers to help out with tasks such as these. Even a couple of trail segments close to the hive of activity along Highway 1 showed signs of aggressive overgrowth. Poison Oak slowed our progress towards one of the Partington Coves and stopped us in our tracks and turned us back on the other side of the highway. Hopefully this was an isolated issue and visitors can still enjoy the park's higher elevations. Coppertone and I did a couple of hikes near the coast at the Pfeiffer Brown State Park. The first around McWay Creek is the most crowded part of the park by far. 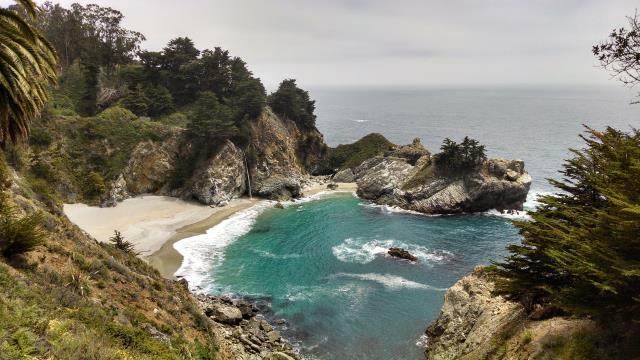 The reason is the cove into which McWay Creek empties via McWay Falls. It's got to be one of the most beautiful spots you're likely to see. A 1980's landslide north of the cove is actually responsible for the sand that now lies beneath the falls. Prior to that event the cove was mostly rock. I think the addition of the sand actually improved the appearance of the falls. It's simply stunning. The second outing a little down Highway 1 around Partington Cove was deserted by comparison. It boasts a couple of coves of its own that were completely devoid of people as we sat in both for some time listening to the waves and exploring the shore. We even watched a sea otter and her pup come within 100 feet of us! Some large switchbacks take hikers from the highway level down to the ocean. The two coves are separated by a steep ridge that would normally prevent moving between the two. Years ago a tunnel was carved into the ridge to allow the movement of supplies from a dock in one cove to the other. Partington Cove has a couple of caves or at least deep depressions at water level into which water would crash and spill out. The crashing waves drown out all noise from the highway above. Halfway between San Francisco and Los Angeles, California’s Central Coast is a treasure of beaches, poppy-dotted meadows, and countless lakes and streams. This region offers a nearby destination for adventurers coming from both Northern and Southern California. Outdoor writer and lifelong Central Coast native Brian Milne has selected his favorite 46 trips for hiking, running, horseback riding, and mountain biking. From easy beach strolls to inland treks, trails range from a half mile to 18 miles, covering the mainland and the Channel Islands. At-a-glance information shows which trips have the best fishing, bird-watching, camping, running, and other activities.